College students are set to face even more disruption because of a lecturers' pay dispute. The EIS-FELA union has announced more strikes and other action which may mean students will not get the results of assessments. The union is unhappy with the cost-of-living pay rise on offer - a 2% consolidated rise covering three years. But colleges say many lecturers have also had big rises because of a scheme to equalise pay across the country. Four one-day strikes have already taken place. Strikes have now been scheduled for 8, 15 and 16 May. Crucially, lecturers will now be taking part in industrial action on other days too. This will involve refusing to record student results in their employer's results system and a withdrawal of goodwill. EIS general secretary Larry Flanagan said: "Scotland's college lecturers have shown their continuing clear support for the EIS-FELA campaign to secure a fair cost-of-living pay rise. "The escalation in industrial action, approved today, has been forced upon us by the continuing intransigence of college management and by the refusal of Scottish government to intervene in relation to this vital sector of our education system. "Lecturers do not relish the prospect of this escalation of action, but nonetheless remain steadfast in their determination to secure a fair cost-of-living pay increase, in line with public sector pay policy. "The EIS would urge both Colleges Scotland ant the Scottish government to consider the best interests of Scotland's FE sector and the students that it serves, and to come back with a fair proposal that will be acceptable to our members and allow lecturers to return to work as normal." Minister for further Education Richard Lochhead said: "I have met with both sides this week and asked that they redouble efforts to resolve this long running dispute. It is encouraging that both sides plan to meet again and I hope that this meeting leads to the successful resolution of this dispute. "Any escalation of industrial action that is designed to specifically target students must be avoided as this could cause potential harm to their academic futures by withholding results or assessments." Colleges Scotland has previously argued that it cannot afford a bigger pay rise without making cuts. 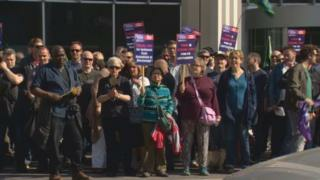 John Gribben, director of employment services at Colleges Scotland Employers' Association, said: "It is extremely disappointing but not surprising news, as the EIS-FELA is constantly on strike and it is their idea of negotiating. The EIS-FELA is out of control and by also committing to withholding students' assessment results they have crossed a line which is recklessly gambling with students' futures.